The Urban Forms Foundation has been activity bringing street art to the city of Lodz, Poland since 2009. Inviting local and international artists such as Sainer, Etam crew, Os Gemeos etc… They are now busy organising a street art festival to run between 1st September until 30th September 2016 called “The Energy of the City 2016”, dedicated to urban cycles: construction – deconstruction – reconstruction. To introduce the imminent festival, street artist Gaia paints the first mural “Dementia”. New york,Baltimore based street artist Gaia, whose style is defined by a deep interest in the place and its history that forms the subject and affects the form of his works. 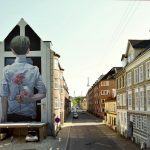 Gaia was the first artist to introduce the festival with his impressive mural titled “Dementia”, referring to the gradual erasure of the past from the contemporary urban spaces. The painting draws a parallel between the demolition of the surrounding neighbourhood and the contested history of Kosciusko as a national figure. The protagonists of the mural are Tadeusz Kosciusko (Poland), and Thomas Jefferson (America). They bonded over issues of liberty and race that fueled revolutions across the two continents. Kosciusko and Jefferson forged an intense friendship based on their shared dreams for the global expansion of human freedom. They sealed their bond with a blood contract whereby Jefferson would liberate his slaves upon Kosciuszko’s death (15 Oct 1817). But Jefferson died (04 Jul 1826) without fulfilling the promise he had made to Kosciuszko-and to a fledgling nation founded on the principle of liberty and justice for all. Gaia mural shows the three versions of the Kosciuszko monument on Wolnosci Square in Lodz, which represent the successive stages of its history: construction in 1930, destruction during World War II, and finally reconstruction in 1960. On the mural the non-existent buildings surrounding the New Centre of Lodz can also be seen.